Munnar: (175 KMS and 5 Hours): Drive to Munnar. On arrival check in to your hotel. Munnar-Tucked away in sunny, tropical Kerala is a cool green paradise. Away from heat and dust. State’s finest Tea plantations. The best Hill station of Kerala… Watch the spectacular beauty of Tea gardens. Enjoy the nature,where the cloud turns into mist, which may touch you with a romantic feeling… It is located 1600 meter from sea level. This hill station was once the summer resort of the erstwhile British Government in South India. Sprawling tea plantations, picture book towns,winding lanes and holiday facilities make this a popular and most wanted tourist place of Kerala.Munnar is an idyllic hill station with its velvet lawns, exotic flora and fauna. Breathing of fresh,cool mountain air is a rare experience. Overnight stay at Hotel/Resort (Munnar). THEKKADY (12O KM and 4 Hours drive).THEKKADY (Ever Green Forest’s Land with Spice Plants). The very sound of the word Thekkady conjures up images of elephants, unending chains of hills and spice scented plantations. In the Periyar Forest of Thekkady is one of the finest wild life reserves in India, and spread acrossthe entire district are picturesque plantations and hill towns that hold great opportunities for treks and mountain walks. This plantation town is situated on the outskirts of the Periyar sanctuary…Come back to the Town in the Evening and shopping is possible in the spice market of these spicy lands…NB: Optional activities like; Elephant safari,Kalari Payattu (A traditional martial Art), Kathakali Show (A traditional performance-Art), Jungle Jeep Safari and Ayurveda Massages etc are available here in Thekkady and these are not included in the package… But, if you are interested in any of these activities, we can guide you promptly with the supplementary charges. Overnight Stay in – THEKKADY. Following the breakfast at 09:00 AM; get ready with your Camera for the wild life scenario… Sharp at 10:30 Hrs proceeding to the Boat Trip in PERIYAR WILD LIFE SANCTUARY. Boat Trip starts at 10:45 Hrs and ends at 11:45 Hrs. Coming back to the town for Lunch…Lunch Break at 13:00 Hrs till 13:45 Hrs. Following the Lunch you relax for one or two hours and on or before 16:00 hrs; we will provide you a SPICE PLANTATION Visit. Fill your bird’s eyes with the lush green spice plants. Blessed with Cardamom and pepper plantations. A generous gift of ginger, clove and nutmeg. And a variety of Ayurvedic medicinal plants. Evening by 18:30 Hrs coming back to the Hotel and proceed to the Dinner in the Restaurant. Overnight Stay in – THEKKADY. Drive to Kumarakom from THEKKADY..(180 KMS and 5 Hours): Check into your Hotel/ Resort.. Situated on the banks of Vembanad Lake, Kumarakom is the favorite destination for bird watchers looking out for migratory birds. Placed on enchanting backwater Kumarakom is a beautiful piece of land engulfed with mangrove forests,coconut lagoons, paddy fields. The water ways offer tourist with a unique experience to go around in boats, have hands on fishing and many other leisure options. The place can be best termed to relax in the lap of harmony. Things to do: Fishing, Boating through broad & narrow canals, Bird watching,Walk through paddy fields and Temple visits. Overnight at hotel (KUMARAKAM). (KUMARAKOM to Alleppey = 80 KM = 2 Hours.) 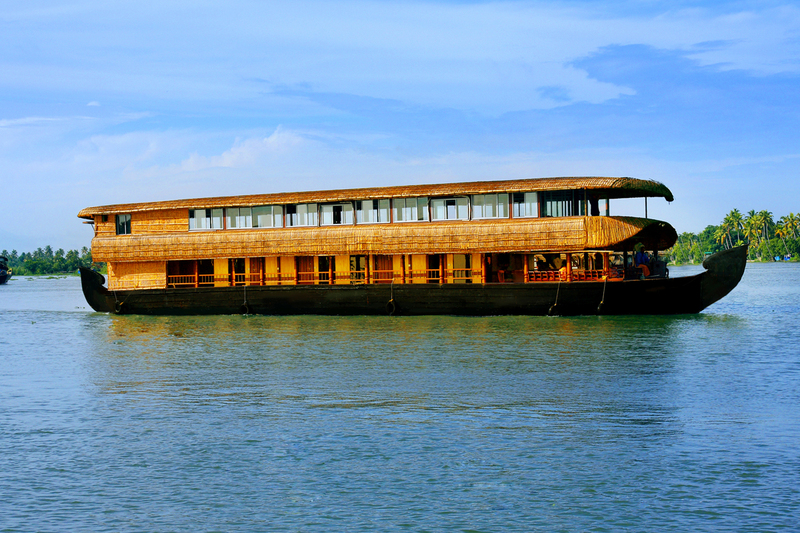 Board on to the HOUSE BOAT from ALLEPPEY: Check in to the Houseboat at 12.00 Noon. With the Arabian Sea in the west and a vast network of lakes, lagoons and fresh water rivers criss-crossing it, Alleppey is referred to as the Venice of the East by travelers from across the world. House boat cruise through narrow canals- Coconut Lagoons – Virgin villages-paddy fields-historical places – Temples – Snake boat – Coconut beer shop (Toddy shop) — R Block Islands – Kuttanad Village etc. Distance covered on each day will be 35 to 40 km on an average/day. Enjoy spectacular lush green paddy fields, where you may enjoy an unique nature, life style of village people and their activities like Coir roping, Toddy tapping etc. All meals will be provided in this A/c House Boat. You may enjoy the splendid sunsets, Waxing moon lights, dreaming stars and of course the delicious foods cooked and served by us. [You are mostly invited to our kitchen in the House Boat, to learn and try the list of ingredients and instructions for making something, especially a traditional food dish of KERALA for the dinner or for the Breakfast. If you are satisfied; don’t forget to note down the recipe and try it in future. After disembarking from the house boat;Take a full day long sightseeing tour of Alleppey Beach , and drive to Kovalam. (220 KM and 5 Hours drive).Check in to the Hotel/Resort near the beach. KOVALAM Beach: This internationally renowned beach has been favorite haunt of tourists since 1930’s. Kovalam consists of three adjacent crescent beaches. Enjoy the beach and remove your hang over of the long trip. Over Night Stay- Kovalam.